There were 15 press releases posted in the last 24 hours and 153,129 in the last 365 days. 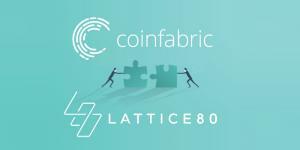 LONDON, UK, April 11, 2019 /EINPresswire.com/ -- LATTICE80, the world’s largest FinTech hub, has announced the commencement of a partnership with the global management consultancy, CoinFabric, which is positioned to usher the Blockchain industry into a new era of widespread exposure and adoption. The agreement comes on the back of the growing need to venture into developing markets, which led to the coalition agreement between two of the industry’s leading organizations. Both organizations are poised to benefit from the vast experience and valuable expertise of their partner, in an effort to solidify their stature and further ensure sustained growth. CoinFabric, which was founded in 2015, is a global management consultancy, and an industry reference in the field of Blockchain and cryptocurrency when it comes to product development and go-to-market strategies. The company prides itself in empowering developers, organizations, institutions and governments to adopt and integrate Blockchain technology into their supply or value chains through their expanding consulting division. Having worked with more than 60 Blockchain and cryptocurrency companies since inception in 2015, and playing an instrumental part in managing one of the biggest tokenized fundraising events in the industry - Dragon Coin having raised $320m in 2018 - CoinFabric’s experience in the space became a driver to establish a healthier Blockchain Economy worldwide. As the hallmark of financial technology expertise, LATTICE80 serves more than 11,000 crypto startups and 200,000 professionals in its database. The company expects to pour in their extensive advanced financial technological expertise that spans across the United Kingdom, Europe, and Asia. In return, this partnership is expected to increase the global footprint for LATTICE80’s groups of companies through intensive Research and Development and Integrated Services. Combined, the newly formed partnership boasts far-reaching outreach across the globe throughout the United Kingdom, Asia, Europe, Africa, Australia and the United States of America. The venture is expected to contribute to the culmination of a progressive and competitive Blockchain landscape that fuels more development and innovation in the financial technology sector. CoinFabric is in unison with their new partners, labeling the alliance as a move towards a more blockchain-and-crypto-driven future. LATTICE80 is a global financial technology hub with its headquarters in London, United Kingdom. It also operates through numerous branches located around the world with the sole aim to assist businesses adopt, develop, and expand using advanced financial infrastructure. The company provides several services to its clientele which includes FinTech startups, established businesses, and corporate firms transitioning to advance Blockchain innovation as well as public awareness entities that look to innovate and further develop financial technology. With its advanced innovation programs, FinTech database solutions, startup accelerator programs and coworking solutions, LATTICE80 is widely regarded as an industry authority in Blockchain industry. If you want to learn more, contact us at info@lattice80.com. CoinFabric is a global management consultancy that specializes in transforming Blockchain, and crypto, projects or companies into agile global businesses that anticipate the unpredictable, and adapt to the market. On the back of a successful 2018 which saw them support the biggest tokenized fundraising event of 2018, CoinFabric is committed to enhancing businesses through extensive R&D, Consultancy, and Integrated Services. Email us at contact@coinfabric.com for more information.